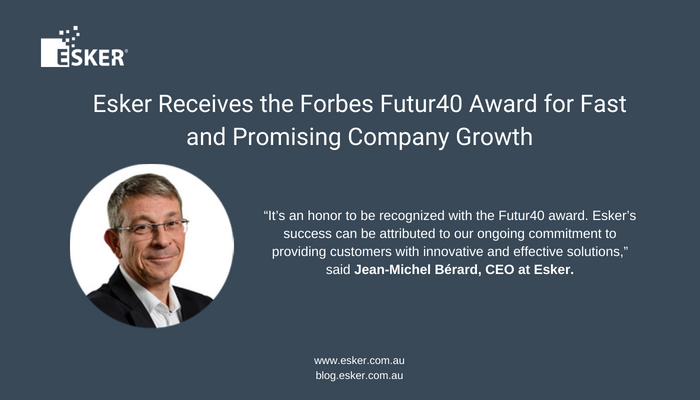 Sydney, Australia — July 23, 2018 — Esker, a worldwide leader in document process automation solutions and pioneer in cloud computing, today announced it was awarded the Futur40 award by Forbes France for recognition as one of the fastest growing listed French small and medium-sized enterprises. The Futur40 ranking is based on data provided by Morningstar. It recognizes 40 non-financial Euronext Paris-listed companies that have distinguished themselves based on the originality of their business model and financial performance over the past three years. The fifth-annual Futur40 awards ceremony took place at the International Financial Forum in Paris on July 11, 2018. This award was presented by Forbes magazine and PMEFinance-EuropeEntrepreneurs, in partnership with Euronext, MorningStar, RSM, and the Federation of Individual Investors and Clubs (F2iC). Esker’s impressive financial performance is marked by the continued success of the company’s cloud-based document process automation solutions, which represent 85 percent of sales. This business growth has enabled Esker to accelerate solution implementation thanks to commercial partnerships and strengthen investments in human resources.